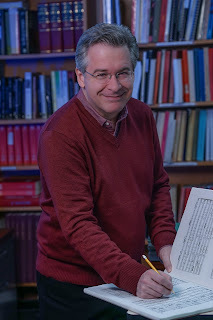 John Keene, Seattle Opera’s Chorusmaster, started with the company in 2013, after five years as Chorusmaster and Head of Music at Florida Grand Opera and five years as Music Director of Opera at Louisiana State University. He is thrilled to be working with such a gifted and versatile chorus. And because his favorite composer is always the one he’s working on, he is thrilled that Baroque operas like Semele are coming back into the repertory. is a big chorus opera. Can you put that in context? It is an enormous amount of work for the chorus. They have 10 separate chorus numbers, none of which are supporting scenes—all feature them singing alone. So it’s the equivalent of 10 arias, and a wonderful showcase. Other operas may have a lot of music for the chorus, but most of it would be supporting or background with principal singers in the foreground. What do you like about Semele’s music? It is sheerly gorgeous, inviting music, very pleasing to hear, and thrillingly dramatic in places. It’s similar in style to Messiah, the oratorio Handel composed just two years earlier. While they have some of the same qualities, Semele has all the makings of opera—the big themes of love, ambition, power, jealousy—and so the music reflects that. How is it different for the chorus to sing in English, rather than the foreign languages common in opera? English is equally challenging. For foreign languages, the chorus has to study pronunciation and learn the meaning and the emotion of that meaning. With Semele, it’s like actors performing Shakespeare—it’s our language but not our modern usage, so we need to figure that out and be sure it projects clearly to the audience. And then you have to decide whether the pronunciation is British or American. Can you talk about how the voices need to blend? I like to use the analogy of cooking. You have all the disparate ingredients of a dish, but they will combine to make a wonderful whole. There is leeway in proportions and in the spices—I try to help it all come together. We have a Regular Chorus of 36 members (28 in Semele). They are very versatile and experienced artists, versatile actors, comfortable in different costumes from modern dress to various periods. As chorus members they bring their wonderful and unique voices into a “blend” so the audience can experience them as an ensemble—but we do want the energy and emotions of each equally important individual. This Staff Chat first appeared in Seattle Opera’s program for Semele in February 2015.